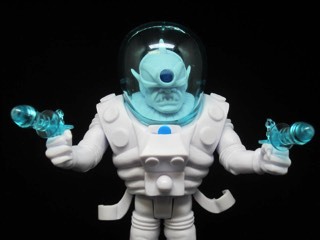 New from Spy Monkey Creations - more figures inspired by various masters of a certain Universe! Click here to see the store. New figures are inspired by Tri-Klops and Webstor, to name a few. Check 'em out! They're coming! But when? I have no idea. I'm looking forward to these guys. Previews have been posted for Alpha 7, Mystron, Commander Comet, Astro-Nautilus, and a second glowing version of Electron+. Good times. I'm dying for Astro-Nautilus. Check 'em out from the official Instragram. I shot this one a couple of years ago, but I forgot to tell you how much I dug the Neo Granthan Gladiator. The silver mold was one of three figures released when the dinosaur-like "Neo Granthan" head made its debut just over two years ago. Prior to that, the Armorvor molds came with wolf heads. I really dug the wolf head, the Neo Granthan is nice, but I've always wished we would see more animal noggins on a regular basis. Such things are not easily supported by artisanal batch action figures. There have been quite a few Neo Granthans since the debut, but not exactly an abundance of silver ones. 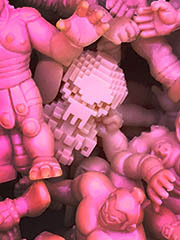 Standing 3-inches tall, Rayexx fills the demand I've been making of the poor, long-suffering makers of Glyos for years. A matching Kabuto Mushi was also made, but I've been pestering team Onell Design and the Outer Space Men guys to do an X-Ray Man Jack Asteroid or X-Ray Woman Tera Firma for years. I hope they still do it. But if they don't? Pheyden's good. I'm happy with Pheyden. The Glyos-compatible line (guest-starring Pheyden) Bit Figs had a drop on Sunday night in the fleshy color of Kinnikuman/Kinkeshi/M.U.S.C.L.E. figures of old. Also, there's a new enamel pin - these are really coming up in indie toy and collectible toy spaces, with lots of new licenses and manufacturers on the radar. Also, there are swell Flying Vipers shirts and cassettes. The curse of completism! 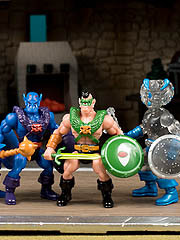 The Outer Space Men doesn't have a lot of subsets - there were a couple of "wave" repaints of fancy recolors, but the only linewide uniform set up until White Star figures were the Infinity Edition figures. All but three of the figure molds came out in white with blue trim by 2014, with no indicaton when - or if - the set would be completed. The concept was neat, but I'd be lying if I said that White Star Cyclops was a gap in my collection that I needed filled. He and his brothers look really cool, with the while plastic doing a good job showing off some details that weren't visible on some of the clear or painted figures. But did I need another Cyclops? X-Ray Bugs! Now this is pretty fancy - an X-Ray Man-inspired Kabuto is joined by numerous other figures, including a new Callgrim figure. Click here to see the March 5 2017 The Godbeast Kabuto Mushi drop menu. A 3 3/4-inch tall upgrade of the base Toy Pizza Knights of the Slice figure, the Vector Jump Outpost Odesskar is one of two (so far) armored-up takes on the figure. It costs a lot more, but you get a lot more plastic... and dang if the whole thing isn't weirdly awesome. It also looks a lot like the Esedeth Desert figures, like Esedeth Desert Assault Team Glyan Action Figure [FOTD #230] which are awesome. It looks like it fell out of the back pages of a late-1980s Japanese modeling magazine.